The Unorthodox Jews are often known as the Reform Jews and it is supposedly a product of 18th and 19th century enlightenment. Most Jews before that time were all orthodox Jews but during the Holocaust almost 70% of those killed belonged to orthodox Judaism. The most fundamental difference between the Orthodox and reform Jews is a result of difference in interpretation and understanding of the Torah. This difference leads to greater divide in the two forms of Judaism . The Orthodox believe that Torah is the direct word of God and cannot be changed. It is a not only inspired by divine, as Reformists would think, but it is from God Himself. Therefore they think that it can only be understood by the Rabbis and there is no room for personal interpretation. Moreover , the correct understanding is only known to God and it is encapsulated in the “halachah,” the law (literally, “way”). The Reform Jews believe in development of Judaism and therefore they consider Torah to be a book about the past and they encourage interpreting it relative to modern times. Torah is indeed very important for Reform Jews however they allow for different understanding of the book given different cultures and customs. The relation of a Reformist Jew is significantly informal and personal compared to that of an orthodox Jew. In a broader sense the Reform Judaism allows for greater flexibility in religious laws that orthodox Judaism. Other differences are mainly in the practices of these two denominations. The status of women in orthodox Judaism is relatively lower than that in Reform Judaism for example in orthodox Judaism the prominent religious roles such as of Rabbis and Cantors are reserved for men. Most orthodox Jewish men wear skullcaps since they interpret the text literally. Reform Jews have a unsegregated synagogue gathering while the orthodox keep men and women separate. As it is expected, the orthodox are more rigid with regard to use of musical instruments and with their food compared to the reformists who allow for playing of instruments in synagogues and are not very particular about dietary laws. These laws as per law are very strict and are adhered by many orthodox Jews, while there is a degree of freedom exercised by Reform Jews when it comes to these laws. The overarching difference between the two denomination is that of rigidity and the level of freedom in interpretation of the text. 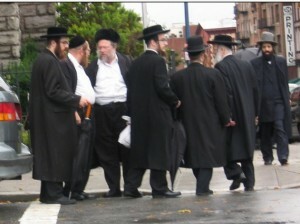 The Reformists are significantly more progressive minded and flexible about religious laws while the orthodox Jews are mainstream traditionalists whose understanding of religion is in line with the ancient religious thought which was based on blind faith and high reliance of religious authorities in matters of laws and other life related concerns. difference in reading and interpreting the Torah. difference in flexibility of law. Reformist believe in development of Judaism. different importance given to Torah. Difference in status of women. Differences in practices and level of liberal attitude. de. "Differences Between Orthodox and Unorthodox Jews." DifferenceBetween.net. April 4, 2019 < http://www.differencebetween.net/miscellaneous/religion-miscellaneous/differences-between-orthodox-and-unorthodox-jews/ >.